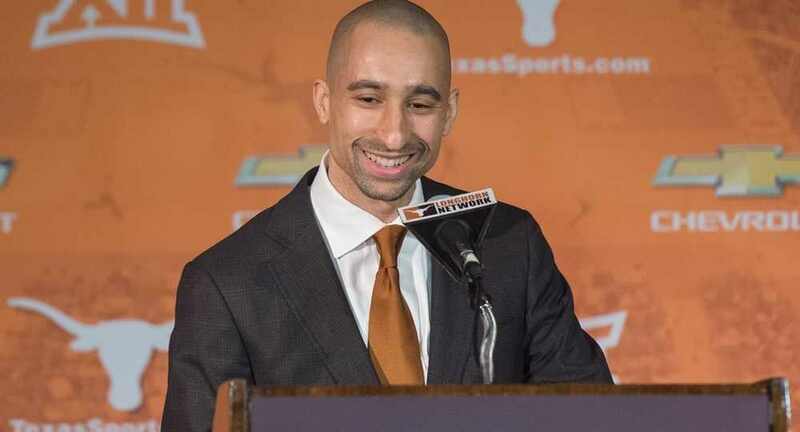 The Texas men's basketball team will play in the NIT for the second time in head coach Shaka Smart's four seasons in Austin (photo courtesy of texassports.com). AUSTIN, Texas — In case it has escaped your attention, the Texas men’s basketball team, which struggled to a break-even record through the regular season, was not named Sunday as an at-large participant in the NCAA Tournament. Instead, the Longhorns will play in the National Invitational Tournament (NIT), and will begin the five-round competition at 8 p.m. Tuesday at home against South Dakota State. Texas (16-16) was named as a one of the four No. 2 seeds in the 32-team event, while the Jackrabbits (24-8) are a No. 7 seed. There was no real expectation that the Longhorns were going to sneak into the NCAA Tournament, since no .500 team ever has received an at-large invitation for the field of 68. This season marks just the third time in the past 21 seasons that Texas will not be a part of the Big Dance, but the second time in Smart’s four years on the 40 Acres. The Longhorns earned 16 trips to the NCAA Tournament in former coach Rick Barnes’ 17-year tenure in Austin. The Longhorns suffered through a nine-year run without an NCAA appearance from 1979-80 through 1987-88. So things could be worse, right? UT's last chance to make the NCAA Tournament died via a first-round defeat at the hands of Kansas in the Big 12 tournament last week. Losing four of its last five regular-season games, a stretch that included two blowouts at Texas Tech and at home to TCU, certainly didn’t help either. Nor did losing in overtime to Baylor after leading by 19 with 15 minutes to play. “Obviously there was a hope there, but we knew coming off the loss to Kansas that it was a long shot,” Smart admitted. Per the NCAA NET rankings, Texas has played the fifth-toughest schedule in the country. The Longhorns’ non-conference strength of schedule was No. 18 nationally. So far it’s been a season of "coulda, shoulda, woulda" for the Longhorns. There have been good wins against the likes of Quadrant 1 teams North Carolina (neutral site), Purdue (home), Kansas State (road), Kansas (home) and Iowa State (home), with three of those by double-digit margins (K-State (20), Kansas (10) and Iowa State (17). But those have been countered with losses that Texas just can’t have, as the Longhorns dropped games at home to Radford and VCU and on the road to Oklahoma State and Georgia. It will be the first time Texas and South Dakota State will square off in basketball. The Jackrabbits (24-8) won the Summit League regular-season championship, thus earning an automatic berth to the NIT once it lost to Western Illinois in the league tournament quarterfinals, and rank sixth nationally in points per game (84.9). South Dakota State senior forward Mike Daum, a 6-foot-9 inside-outside threat, ranks sixth among all Division I players with 3,042 career points. Texas will be without freshman post Jaxson Hayes, who suffered a knee injury in the final minutes on Thursday against Kansas. Smart said Hayes has had a MRI and will seek another evaluation. Hayes is unlikely to return this season. It’s the fourth time the Longhorns have participated in the NIT, a storied, if secondary, event which has held its semifinals and finals each year since 1938 at Madison Square Garden in Manhattan. UT's most recent appearance was in 1986, when it won the NIT in 1978 while led by Longhorn legends Jim Krivacs and Ron Baxter. The tournament was originally the most prestigious postseason showcase for college basketball but has since been eclipsed and lapped by the NCAA Tournament. TCU won the NIT in 2017, and Penn State is the defending champion. If Texas wins Tuesday, it would play the winner of the first-round game between Xavier and Toledo. • The current three-point line is extended 1 foot, 8 inches to 22-1¾, the same distance as the FIBA three-point line that’s used in international basketball. • The lane is widened from 12 feet to 16 feet, making it consistent with the width of the lane used by the NBA. • The elimination of bonus free throws and resetting of team foul as each half shall be divided into two 10-minute segments. This shall not include overtime periods. • Halfway through the first and second halves, team fouls shall be reset to zero for each team. A team shall be awarded two bonus free throws beginning with the fifth team foul assessed against an opponent during each 10-minute segment, or the second team foul committed with under two minutes remaining in each half if that should occur prior to the fifth team foul in the second segment of either half. There will be no one-and-one bonus free throws. • Team fouls also will be reset at the beginning of each overtime period. During each overtime period, a team shall be awarded two bonus free throws beginning with the fourth team foul assessed against an opponent, or the second team foul assessed against an opponent with under two minutes remaining in each overtime period if that should occur prior to the team’s fourth team foul in the overtime period. • The shot clock will be to 20 seconds after an offensive rebound instead of 30 seconds.